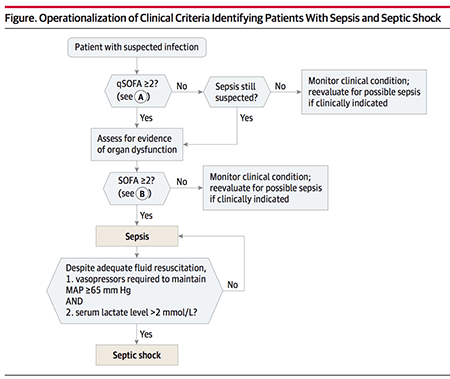 Sepsis 3.0 replaced the SIRS criteria with a new risk-stratification tool, qSOFA. qSOFA was initially developed within the Sepsis-3 publication itself. Until now, qSOFA has never been validated. The value of qSOFA vs. SIRS remains controversial. 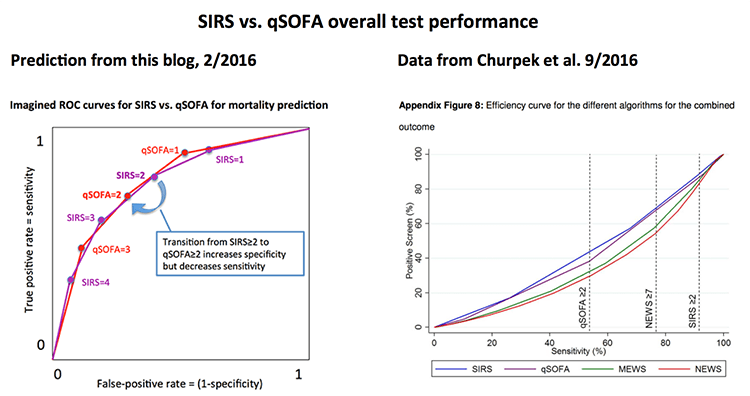 Churpek 2016: qSOFA, SIRS, and early warning scores for detecting clinical deterioration in infected patients outside the ICU. This was a study of 30,677 patients in the emergency department and ward at the University of Chicago who were suspected of having infection (defined as any anyone cultured and started on IV antibiotics). 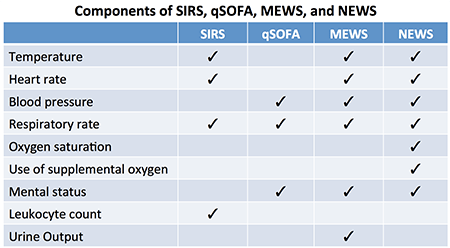 Electronic records were retrospectively analyzed to calculate SIRS, qSOFA, and two risk-stratification scores (MEWS and NEWS). These scores were compared to a primary outcome of in-hospital mortality and a combined outcome of mortality or ICU admission. This study focused mostly on the highest test score before ICU transfer, rather than the test score at the point in time when infection was first suspected. This data won't apply to the bedside clinician who is interpreting the test score at a single time-point. For example, the sensitivity of a single test score will be lower than the sensitivity of the worst score before ICU transfer. This figure explores when these indices turned positive. The cumulative likelihood that a patient would meet various criteria at any point in their hospitalization is shown, prior to the time of death or ICU transfer. 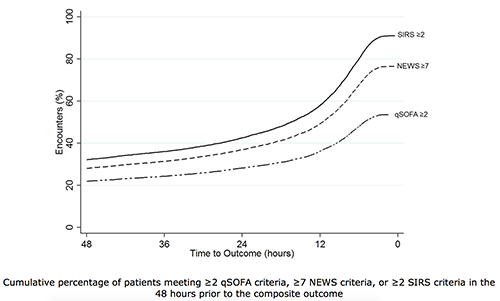 The sensitivity of qSOFA is poor, especially >12 hours before deterioration (<40%). 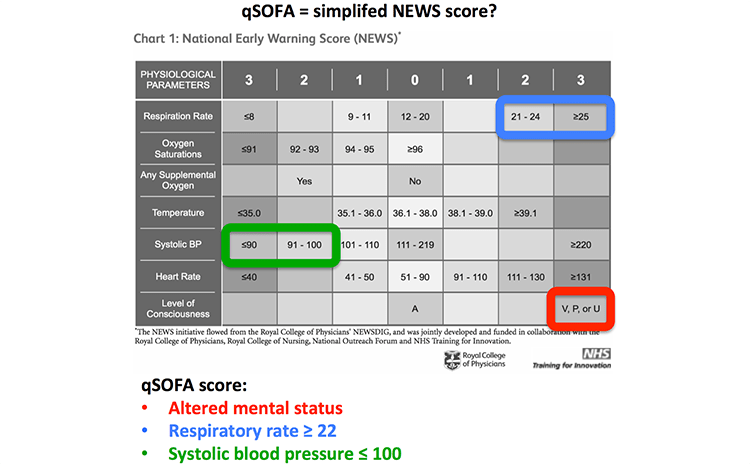 Indeed, if you look very carefully at the NEWS score, it actually contains the components of the qSOFA score (figure below). Since qSOFA is effectively a pared-down version of the NEWS score, it makes sense that qSOFA shouldn't perform as well. Where does this leave Sepsis 3.0? Sepsis-3 still hasn't been widely adopted into hospital protocols or Medicare guidelines. Widespread change of such protocols requires an enormous expenditure of time and money (e.g. re-writing policies, educating staff). Such change can only be justified by a definition which has been successfully validated. Failure of qSOFA to be validated suggests that additional evidence is required before considering adoption of Sepsis-3. Should we follow the lead of our colleagues in the UK? These organizations don't recommend qSOFA as a primary evaluation for sepsis. Instead, the screening test for sepsis in the UK is the NEWS score. They may be far ahead of us on this one. Notably, the NEWS score has been successfully validated and deployed on a large scale. 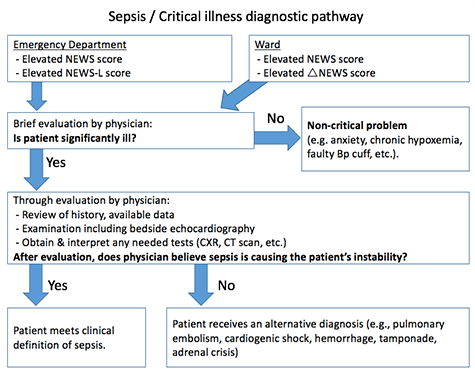 If the NEWS score is used, it should be understood that it is not a test for sepsis. NEWS is a global risk-stratification tool which identifies patients who are critically ill from any disease. Thus, an elevated NEWS score should prompt a thoughtful evaluation for any potential life-threat. Increased utilization of risk-stratification tools such as NEWS could facilitate early recognition of sepsis as well as other critical illnesses (cardiogenic shock, pulmonary embolism, hemorrhage, etc.). This study doesn't support the Sepsis-3 definition. Further evidence is needed before considering the widespread adoption of qSOFA and Sepsis-3. The British approach using the NEWS score appears superior. Addendum 2: This is in response to a discussion with Jon-Emile (see below). Churpek MM et al. qSOFA, SIRS, and early warning scores for detecting clinical deterioration in infected patients outside the ICU. E-pub ahead of print in Am J Respir Crit Care Med. UK Sepsis Trust toolkit & statement regarding Sepsis 3.0, also see interim statement about sepsis 3.0. The misapplication of severity-of-illness scores towards clinical decision making. Moskowitz A et al. AJRCCM 2016. It might have been more appropriate to designate the primary outcome as the combined outcome of mortality or ICU transfer. The real goal of identifying patients with sepsis is to transfer them to the ICU (and prevent mortality), therefore it would be logical to include ICU transfer in the primary outcome. I know it takes longer and more data to calculate, but where does the full SOFA score fall in the reliability/utility here? Argument being that by the time you can calculate the full score it may be too late? Is the NEWS-L validated? I am drafting a prospectus for a research project that hypothesizes that the use of a screening tool will increase early identification of sepsis and initiate goal directed therapy faster. I was planning on the use of the qSOFA, until I came across this information that it is not valid tool. Hi , I am seeking helping for my DNP project. I was planning on using the qSOFA score for early identification of high risk home puts with suspected infection. Unfit. I am not allowed to use a point of care lactate, therefore thought the qSOFA would be the most direct on identification. However, after reading a few recent studies from 2016/2017 I am second guessing myself. Please share your insights. Thank-you! Comment Here – Speak Your Mind – Also leave your name, affiliations, and any conflicts you may have. In Sweden we use a triage/decision tool guide in the ED and ambulance called RETTS in which the recommended basic labtests include lactate from the second lowest triage level. The vital parameters match NEWS scores and combines with emergency symptoms and signs to establish a medical statistical level of potential lethal illness. Thanks, Jon-Emile, that’s an interesting perspective. I agree with you that SOFA probably has similar performance to NEWS or MEWS. 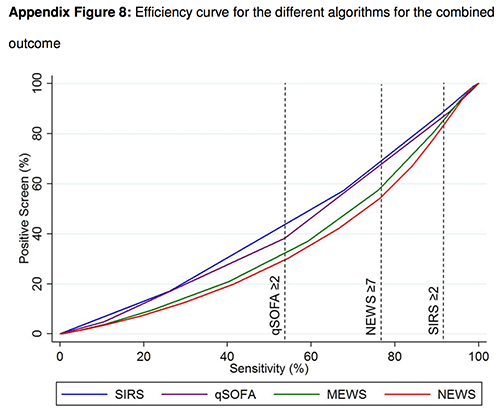 Yu 2014 found that SOFA and MEWS had statistically similar performance (https://ccforum.biomedcentral.com/articles/10.1186/cc13947). NEWS does have an advantage compared to SOFA, which is that it can be performed immediately at the bedside of any patient without requiring any labs. This may be a major advantage, particularly when triaging patients in the ED who have no labs or evaluating a ward patient who hasn’t had a fresh set of labs in a while. My guess is that different settings might require different strategies for detecting sepsis. For example, in the ED, NEWS and/or NEWS-L might be useful (NEWS-L is the NEWS score plus the lactate level in mM). 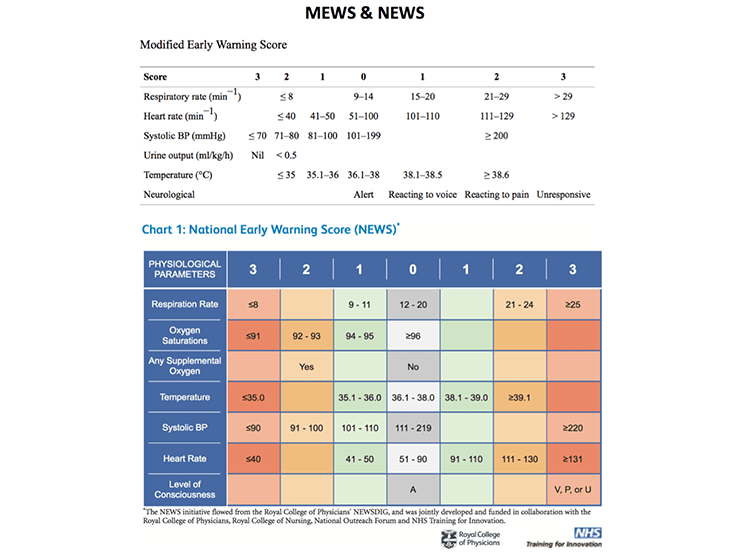 Alternatively, for patients on the ward, the NEWS score plus the delta-NEWS score could be helpful (to look for deteriorations in physiology over time – information that is essential on the ward but often unavailable in the ED). Thus, the concept that there is a *single* best way to define sepsis may need to be revised. Thanks for the Yu paper, i will check it out. Do you think that sepsis 3.0 should now include/require end-organ dysfunction [in effect, become the old ‘severe sepsis’]? “presumed infection [however, the clinician wants to define this, which often inherently includes SIRS] + evidence of end-organ dysfunction [however the clinician wants to define this, which inherently includes much of NEWs, MEWs, and SOFA]? I don’t think that’s crazy at all. I put a diagram above (see “addendum 2”) showing how I would define sepsis. No definition is perfect, but this could be a reasonable approach to sepsis & sick patients. Often sepsis ends up being a diagnosis of exclusion. That’s probably OK as long as you’ve exercised due diligence in excluding alternative diagnoses. One useful aspect of this definition (and illness-severity tools like the NEWS score) is that they may help us identify patients with critical illness in general, not just patients with sepsis. One possible problem with this definition is that it might not be specific enough for research purposes. However, ultimately it’s up to clinical trialists exactly who they want to include in their studies. Maybe a bit off topic, but how do you actually measure respiratory rate in your practice? I find this parameter quite cumbersome to obtain and yet a lot of these scores rely heavily on this number. We do?t routinely measure RR at triage or at examination nor do we have a standardized way how to do so. We note if the pt is tachypnic, where the cut off is around 30/min… I wonder if there is a simple, reliable and reproducible way how to do this. Our monitors record respiratory rate, although at times they seem to err on the high side. For a patient in the ICU, I will generally trend the respiratory rate based on the monitor (which is transcribed into the vital signs). When evaluating a patient in the ED for possible ICU transfer, if in doubt I will actually measure respiratory rate manually, by counting breaths for 30 seconds and doubling it (either watching the patient or listening with a stethoscope). That may sound silly, but it’s a very important parameter and its often not measured accurately. So the short answer is that I don’t have a great shortcut for this, sorry. Great review Josh. As an intensive care clinician, Sepsis 3.0 just doesn’t ring right – not clinically and probably not even from a public health perspective, in terms of identifying patients early and treating early even if that means over-treating. It feels like something of a noble failure as its intentions were clearly well motivated. What are the ‘efficiency curves’? They look like a mirror-image of a ROC curve and are presumably some variation thereof. Hadn’t encountered these before! Thanks again for some thought-provoking reviews. Thereafter, I would continuously apply another tool that provided a trigger for escalation beyond ward therapy e.g. needing inotropic support, RRT, ventilation. At what point during the course of their disease do you think these patients ought to be transferred? The main idea of ? ?a new definition of sepsis is the identification of patients at high risk. Not all patients with SIRS will have high risks. Therefore, in my opinion, it is not fundamentally how you define risks (for example, UK management), the main thing is that a patient with an infection and high risks is a sepsis patient. If we are careful, the authors suggest using qSOFA, when the use of a full SOFA is not possible. It’s like using D-Dimer to diagnose PE: a positive result does not guarantee 100% availability of PE, but high risks and requires a specific diagnostic and treatment approach. Nice analysis, but I think using the algorithm shown in addendum 2 will take much too long time to be able to give septic patients antibiotics etc within one hour after suspicion. Obtaining CXR/CT etc often delays the diagnosis, and in the face of serious illness, treatment -decisions often have to be made before these test results are available. I see that NEWS2 was released for use as of Dec 2017. Your thoughts? It looks very promising and is approved for use in Europe.